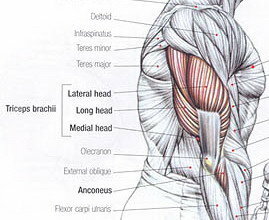 triceps brachii | So You Wanna Get Jacked? A favourite of mine and all guys a like, and ladies, if this isn’t one of your favourites, it soon will be. All men want big, full, peaked biceps and horseshoe tri’s. For the ladies, tight and toned does the job. Nobody wants flabby arms, the fix? Read on. The largest muscle you’ll notice is the biceps brachii. The term bicep means two heads, and the biceps brachii has both a long head and a short head. These heads work together to allow flexion at the elbow and shoulder, as well as supination (holding with an underhand grip). The brachialis is the main flexor of the forearm and the pronator teres flexes the forearm at the elbow and allows us to pronate at the forearm. What does this all mean? Essentially, it means that the main job of the bicep is to allow the arm to flex at the elbow. ^ – These four lifts limit the amount of momentum of the movement and therefore really isolate the bi’s and are effective in giving your biceps that highly sought after peak! The long head is the longest head of the triceps. As you can see in the photo, it runs down the arm alongside the body. The medial head is found in the middle back portion of the upper arm and the lateral side is found on the outer side of the arm, it completes the triceps and gives it that distinct “horseshoe” look. The main function of the triceps is to straighten the arm by extending at the elbow, while the long head of the arm also works simultaneously to bring the arm down toward the body. + – These exercises are great for adding size to the triceps with heavier working loads. There we have it folks, the complete go-to guide to building your arms. Now that you have a better understanding of the anatomy of the arms, lets get to growin! Until next post everyone, stay jacked! !